Today I’m teaming up with 28 other lovely bloggers to bring to you all the “Blogging Essentials Giveaway”, which will be part of a three installment giveaway that will take place over the next couple of weeks! Each week we will be giving away a STELLAR prize essential to any blogger! 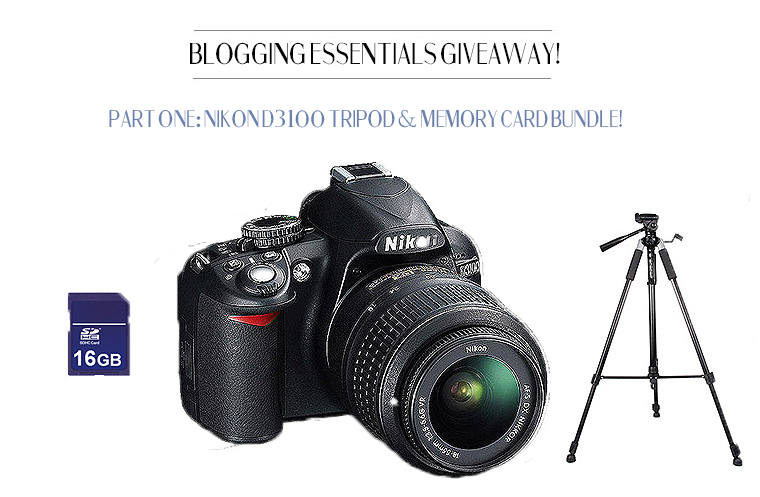 Our first prize will give one lucky winner a Nikon D3100, Tripod, and Memory Card Bundle. Because, as we all know, quality photos are a key piece in creating a great online space! Make sure to complete as many or all of the entries as you can not only to increase your chances of winning, but also because meeting new and stellar bloggers is awesome! These are the only rules for the giveaway…. Rule 3: The winner’s entries will be verified.